Less than a week after the Seattle City Council approved the head tax on Monday, a coalition of businesses launched a referendum that would put the issue up for a citizen vote instead. The coalition filed a campaign, calling it No Tax On Jobs, through the Seattle Ethics & Elections Commission on Friday. If the campaign gathers enough signatures, the referendum will be put on Seattle's November general election—the same time voters will already face a property tax to help fund education. The referendum needs 17,632 signatures from Seattle voters within 29 days of when Mayor Jenny Durkan signed the head tax into law, which was Wednesday. 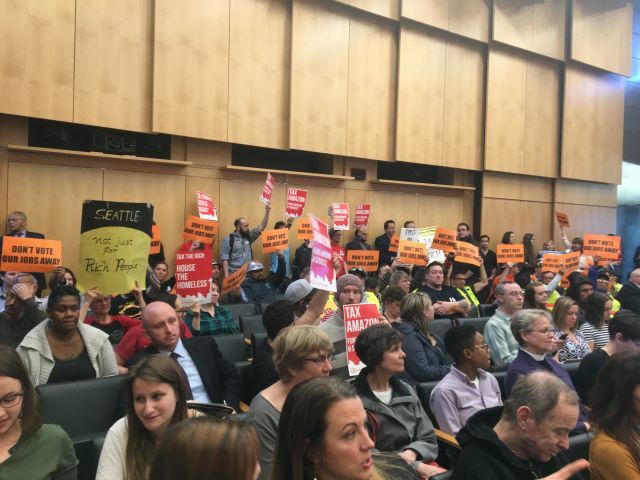 Seattle council members unanimously approved a head tax that would raise an estimated $47.5 million a year for affordable housing and homeless services. It's a 14 cent tax per employee hour, or about $275 per full-time employee per year, affecting for-profit companies making $20 million or more in taxable gross receipts. No expenditures or fundraising has been reported as of Monday.